the word ふるさと furusato literally means “hometown,” but it can also mean home, or where one belongs. being a person who calls japan a second home – my REAL home, where i am happiest and at my most natural, it is heartbreaking to see the damage caused by the great tohoku earthquake last friday. it is not something that could have been prevented, but i am glad that japan is such an efficient country, and i am touched time and time again by the warmth, kindness and honesty of the japanese people in difficult times like these. being far away from japan right now, there is nothing much i can do but keep a close watch on them, and pray for the best. this song was performed by arashi and many other young japanese singers during the annual kohaku utagassen program this year, and it is perhaps the most suitable song for this particular moment in time. the lyrics really warm one’s heart, and i believe every single word in it, is true. today, i went to class with just a t-shirt underneath my normal parka =w= in the middle of winter. whatever happened to the blistering heat of malaysia?! at this rate, i am going to die when i go home hahah! i think it was the fact that it was 3°C the day before, and then below 2°C after nightfall almost every night, that made me think that 17°C is warm. being here has made my perception of “hot” all messed up now hahah! anyway, now it’s back to 7°C now as i type and i can hear the wind howling (literally) and my windows are vibrating a little due to the sheer force of it. scary as it may sound, i actually find it quite soothing. the whirring wind that comes and goes ocassionally throughout the night that reminds me that no matter what, something is happening in the world outside even as i sleep and dream of things that will never come true. yes, i do admit to being a geek. or nerd, whichever suits your fancy. that having been said, i am probably a disgrace to the geek community, as i’ve always joked with my friends. in the olden days, the word “geek” means someone who studies a lot, has practically no social life whatsoever and does not really care about their physical appearance, prefering to spend that precious time finding out how many miliseconds it takes an average human to blink their eyes. and yes, i do care about my physical appearance, despite how i act sometimes. i buy and use nail polish. i have weekly mask routines to pamper myself. i put on some powder and blusher whenever i go out on a special occasion. i want to own a kimono in every shade of colour known to men (or women). i wish i had the money to buy everything and anything from the face shop. listening to moriyama naotarou’s songs often made me think about a lot of things. a lot of SAD things, might i say. his voice is just filled with raw emotion and feels pure, untainted with commercialism that so often comes with a huge percentage of japanese pop songs today. it’s odd how much more sad i feel everytime i listen to his songs, yet somehow i feel stronger and more determined than ever. funny, isn’t it? 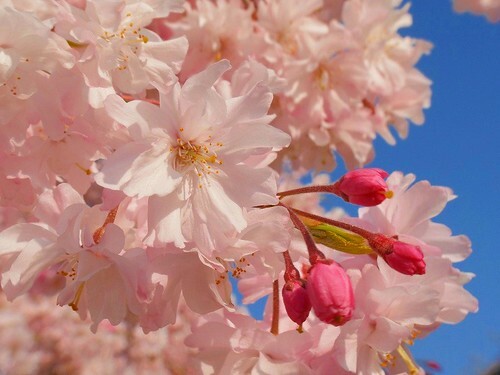 “sakura” makes me wonder about my graduation in the future. it’s a given that i won’t be studying with my current classmates anymore after this semester ends, that i won’t be graduating alongside some of the best friends i’ve come to know in my university days. many people tell me that what i am getting in return is well worth the sacrifice, seeing as it is a chance that not many people have, a chance that might never come ever again. nevertheless, regardless of how lonely it might be, it will be a road i must walk by myself if i want to experience what i’ve been longing for these past 8 to 10 years. i must remind myself that although i’d like to think that friendships and human relationships are not that fragile, not that easily broken, reality is harsh. but in my naive heart i will keep hoping that no matter how long, and how far the distance, the bonds that i’ve made in these past couple of years shall last for as long as i live. therefore, my new year’s resolution would be to love and appreciate everyone, and everything around me. since the new year is just around the corner, i thought it would be fun to see how much i had changed in these past couple of years. 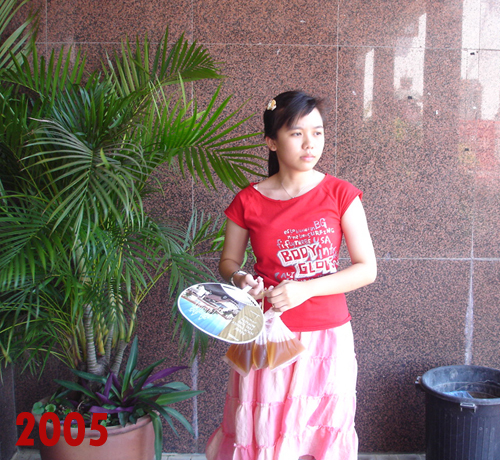 i lost all my precious photos and datas that was in my old computer due to a hard disk malfunction so the photos i could find dated furthest back was… lessee, year 2005? have fun. i loved that dress so much i wore it at least once a week! 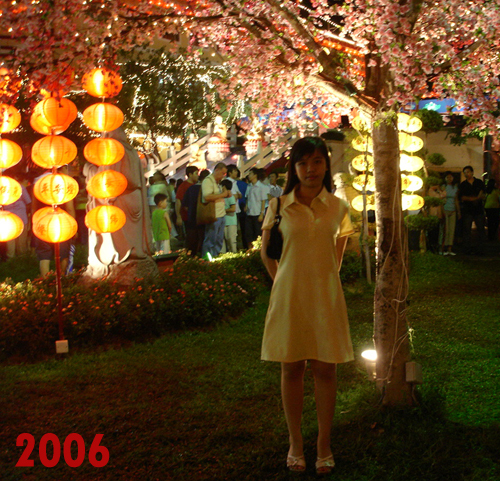 but now i have no idea where that dress is ;_; this photo was taken during the chinese new year in… a temple far far away called fgs dong zhen (no idea what it means) 😀 my legs look less fat in this photo lol. 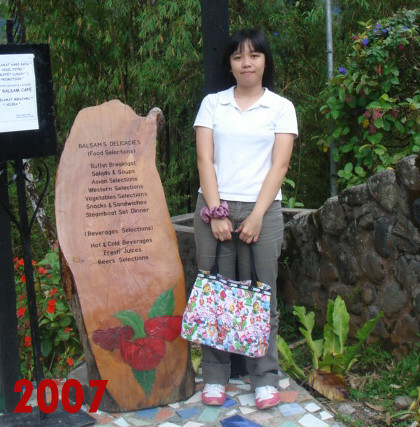 2007 was my first time (and hopefully not my last) travelling to east malaysia, sabah. this photo was taken at the mount kinabalu national park. i look tired! this year would be one of the most exciting years for me so far… a lot of firsts for me! 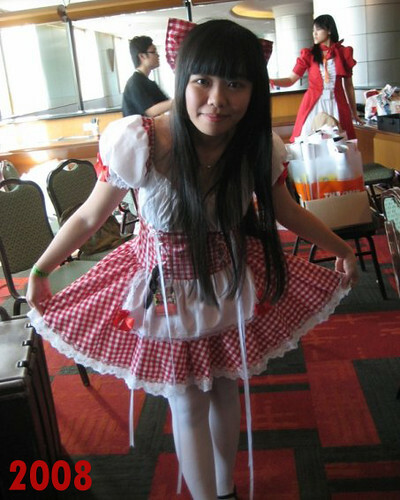 i shall save that talk for another entry, though 😀 this photo is taken by my adorable “sister” karie at the recently-held comic fiesta 2008.